Lent is a forty-day period before Easter, beginning on Ash Wednesday. We skip Sunday when we count the forty days, because Sunday commemorate the Resurrection. Lent begins on March 9th - 2011 - Ash Wednesday. This is a time of struggle, renunciation and intentional suffering. As it is mentioned in "All and Everything" by G.I.Gurdjieff, it is a time to provide shocks to "the Planetary body", by means of abstinence. This period of the year is an opportunity open to us to acquire the strength necessary to overcome the impulses of our denying forces, by creating conditions of sacrifice and intelligent suffering, like "fasting and prayer. ���������������� The arch-preposterous / "All and Everything"
Fasting means not eating anything, while abstinence means not eating some things. Fasting is what Muslims do during the Ramadan between sunrise and sunset. The Christian Lent meant in its origins abstinence of all food of animal origin. Ideally there was only one meal a day. 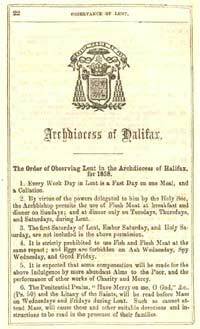 "Traditionally, in its origins Christians abstain from meat consumption during Lent"
"Every week Day in Lent is a fast day..."
1858 Church Calendar, given out to all priests. Now all that is left for very few catholic is Friday as an obligatory "fish day" In this way one was weekly reminded of Jesus who died on the cross on what we call "Good Friday". "And even this one surviving food custom is either already fading completely out of the ordinary life of the followers of this religion, or its observance is so changing year by year that no shock is obtained from it for the fasters, though it was just for that shock that this "fast" was established"
Lent is 40 days long, but there are 46 days between Ash Wednesday, and Easter. This takes us back to the earliest days of the Church. Christ's original disciples, who were Jewish, grew up with the idea that the Sabbath�the day of worship and of rest�was Saturday, the seventh day of the week, since the account of creation in Genesis says that God rested on the seventh day. Christ rose from the dead, however, on Sunday, the first day of the week, and the early Christians, saw Christ's Resurrection as a new creation, and so they transferred the Sabbath from Saturday to Sunday. Christians were forbidden to fast and do other forms of penance on Sundays. Therefore Sundays could not be included in the count.